People are uncomfortable with artificial intelligence because they feel that robots are impersonal and untrustworthy. This leads people to spend time tricking robots, reducing productivity. How might we create a new feature on a chatbot to allow users to connect humanely with robots? I focused on Singaporean users (abroad and in Singapore) because the city is a melting pot with multiple different languages and cultures. My audience were Singaporean chat users between 13-80. Three personas were developed using empathy by focusing on user pains and goals. Brian Tan was fleshed out based on interviews and surveys. used Siri, but were unfamiliar with Alexa. preferred using video and emojis to connect. did not use the Google Hangouts app. From these takeaways, sketches and paper prototypes were developed in ideation to create a chatbot who responds using voice, text, and includes a voice-emoji translation response feature. 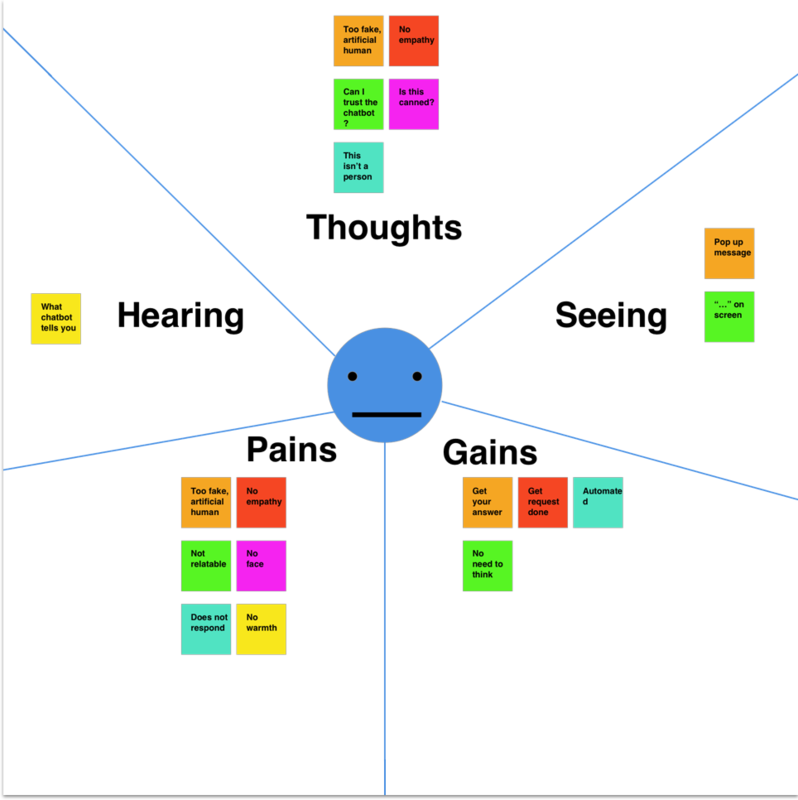 An empathy map was created based on a user's experience chatting with a chatbot. Because a chatbot lives inside a platform, the user's thoughts, pains, and gains all reflected similar priorities related to lack of humanity. The empathy map was focused into an affinity map. The affinity map confirmed the major pain point of lack of humanity. 9 sketches were initially created. A final paper prototype was tested on users. Usability tests revealed that people liked to voice chat in 4 other languages besides English. A digital prototype was developed from the paper prototype. Because Blair is animated, she is fun, relatable, and will not cause any problems between my persona, Brian Tan and his girlfriend. Blair is Facebook Messenger chatbot that can be accessed by searching "Blair" in a user's contacts. Once a user clicks on Blair, Blair is voice-activated and speaks, introducing herself. Blair is always listening, like Siri and Alexa, but interactive. The user can ask Blair for a restaurant recommendation using her voice or chat. Blair will respond with both voice and chat. Blair's voice feature can be turned off by turning the volume off the user's phone or clicking the back button so the bot stops speaking. *Some images belong to the Noun Project and have a Creative Commons license.